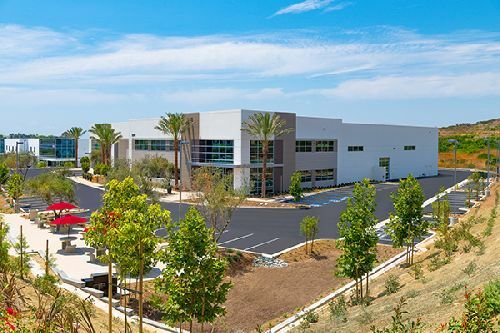 Badiee Development has completed construction of Innovation Ridge, an industrial project formerly branded as the Carlsbad Victory Industrial Park. The 55.6k sf building is located at 3248 Lionshead Ave, and offers an abundance of modern and highly desired design features. “Innovation Ridge is the first of five new industrial offerings Badiee Development will bring to market through 2018 to North County San Diego, where new, Class A industrial buildings are in great demand,” said Ben Badiee, CEO at Badiee Development. Innovation Ridge offers large outdoor work areas, park-like landscaping and architecture, a basketball hoop for employee recreational use and expansive windows and skylights providing abundant natural lighting. The building also features four solid and three full glass grade-level loading doors, two truck wells with convenient drive around access, an FSA Fire Suppression System, four electric vehicle charging stations, 26’-28’ clear heights, and is divisible for up to two users varying from 20,000 square feet and up. TFW Construction is the general contractor and Dennis Visser and Aric Starck of Cushman & Wakefield are the leasing brokers for Innovation Ridge.